I recently started writing a book review on Crystal Clear: A Human-Powered Methodology for Small Teams by Alistair Cockburn. Check out the first part of my review. I have read Chapter 1 entitled Explained (View from the Outside). It was a very interesting chapter that set Crystal Clear as the answerer to Alistair Cockburn. It made many aspects of the Crystal family clear in my mind. I enjoyed the questions, and the answers were insightful and helped me to put the ideas into a whole picture. At the moment I am reading Chapter 2 entitled Applied (The Seven Properties). Frequent Delivery, Reflective Improvement, and Osmotic Communication made sense to me and aligned somewhat to my own beliefs. When I started reading the fourth property, Personal Safety, certain parts seemed fine, while others set off warning bells. I believe that the purpose of any team is to progress. This is achieved through trust, respect and unity. Cockburn says “Once personal safety and amicability are established, a useful, playful dynamic may emerge. People may wage competition with each other. They may argue loudly, even to the verge of fighting, without taking it personally. In the case where someone does take it personally, they sort it out and set things straight again.” – page 31. The statements above concern me. Cockburn addresses trust by saying that people will not take it personally. Respect is lost because they “… May argue loudly, even to the verge of fighting”. I would be unable to say that I respect someone if I yell at them or even raise my voice. Now unity is completely destroyed. For some reason our society and many societies around the world not only condone competition, it is seen as a way to judge attributes of excellence in an individual. This is not a good sign for our progress towards unity in human civilization. I agree that being polite and not stating one’s opinion is harmful for trust. However, it is preferable to use consultation instead of competition. Imagine that a team is encouraged to compete with itself to achieve better results. Would there not be feelings of resentment or heightened levels of stress? Now imagine a team that is encouraged to consult and raise the team together without focusing on individual success. Would not this team feel excited to be around each other? Would they become fast friends and grow as a unit? Would family members of the team be enthusiastic to be included in picnics and socials? What is better, individual success or team unity that add value to not only the team but all who interact with them? I will continue to read this book and post my reviews. I find it interesting that this book has helped to see the confusion that is happening all around the world in terms of progress, success, and human development. I welcome any comments on my posts. Check it out: whiteboardwiki.org. Looks like it’s very flexible. Has some bugs and lots of basic features yet to be added, but since its open source, we can all contribute!!! Development is being organized in an agile fashion using a product backlog. Fun. I have just started reading Crystal Clear: A Human-Powered Methodology for Small Teams by Alistair Cockburn. I was not too sure what this book would provide for me in the way of relevant learning. I am intrigued that this work came out of years of experience by Alistair. 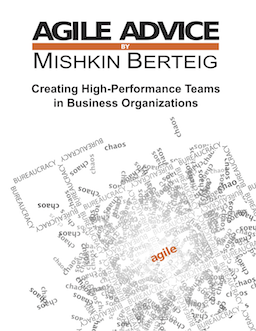 This quote from the book “Crystal Clear does not aspire to be a “best” methodology; it aspires to be “sufficient,” in order that your team will shape it to itself and then actually use it.” gave me hope. I work on a small team and I wonder about which practices will best suit our situation. I also wonder how our team can use tools and processes then reflect on their usefulness to decide if we will continue their implementation. I am interested in reading the whole book, but a little concerned that there will be too much techno-words used throughout. I have a background in business, marketing, and the web but not to the degree of the some of the other books that I have read. What learning have you gained from working on small teams? Have any of you read this book? If so, did you gain any insights that would help my team to develop?